On May 13th 1985 Dire Straits released what became one of the hugest albums of all time when their fifth studio album, Brothers In Arms, hit the shops, and, like the guitar (Mark Knopfler’s 1937 14 fret National Style O Resonator) on the cover, went stratospheric. Helped enormously by the both the invention of the CD, which this album was squarely aimed at, and the fledgling MTV music station that seemingly had the lead single, Money for Nothing, and its iconic animated video on repeat play the album has sold over 30 million copies with Grammy and Brit awards being garlanded on it. 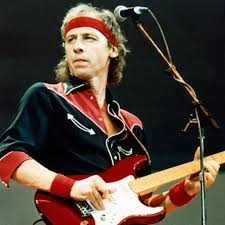 Featuring a development of Dire Straits adult orientated rock music it tapped into band leader Knopfler’s love of Americana, with blues licks and country music themes prevalent throughout the album. 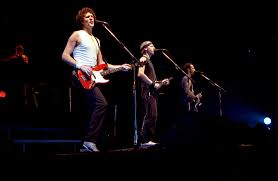 Dire Straits, from their earliest incarnations in the mid 1970’s had gone through personnel changes as Knopfler tried to find the musicians who could support his desire to embrace new technology, such as the compact disc, and ways of recording before starting work on this album in 1984 in Air Studio in Monserrat. The line up now included bassist, and original member, John Illsley, keyboard player Alan Clark who joined in 1980 and drummer Terry Williams who came on board for The Love Over Gold album three years previously. Making up the band was keyboard player Guy Fletcher. Production duties were shared between Knopfler and noted jazz producer, Neil Dorfsmann who also mixed and engineered the album at the Power Station in New York. During the recording it was felt that William’s drumming wasn’t up to the job in the studio with noted jazz player, Omar Hakim, taking the sticks for recording whilst Williams re-joined the band for the live work; indeed it is Williams improvised drum intro to Money to Nothing on the recording too. The album itself got some scathing reviews in the British press in particular, with accusations of blandness, over production and of being a sell out. Criticisms were levelled at Knopfler’s lyrics, and to be fair there are moments of clichéd horror; ‘security was laid back and lax, you must have had a pass key made of wax,’ from Your Latest Trick does jar. But, on the whole, this is an album that showed a maturing of Knopfler’s poetry with, in particular, his desire to touch on subjects protesting war with the 3 of the 4 tracks on side 2 being concerned with war and what it does to those that fight; Brothers In Arms, the title song that ends the record, was written in 1982 during the Falklands Conflict and was re-released to raise money for soldiers suffering from Post-Traumatic Stress Disorders. Musically this album showcases Mark Knopfler’s greatest talent as being a space leaver. Through out the album, despite his hand being on the tiller production wise, the temptation to fill the album with his undoubted skills is always balanced just right. The fade out of Why Worry is sublime and treated with a gentle touch. Mark is also happy to share the limelight with the other players in the band, Illsey’s bass is throughout a beautiful accompaniment, and the keyboard work of both Clark and Fletcher add layers of intricacy to each song, without over egging the pudding at all. Even the inclusion of co-writer Sting, on the noisy rocking Money For Nothing is just right, it fits, its compliments. 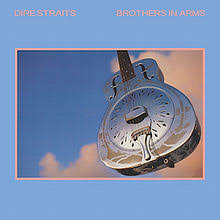 But perhaps the greatest achievement on the album is the amazing title and end track, Brothers In Arms. This song is, in my view, without doubt the greatest end track of any album ever recorded. It is a near 7 minute wonder, treated with amazing empathy by all the players. It has a guitar solo that perhaps is only surpassed or equalled by David Gilmour’s Comfortable Numb; it is a guitar solo that interplays with Alan Clark’s Hammond organ in a way that is perhaps only comparable with the work of fiddler Dave Swarbrick and guitarist Richard Thompson on Fairport albums such as Full House. Brothers In Arms is a song so achingly beautiful that it can make the listener cry and grieve for the end of the album as the solo’s fade and die.